Mr. Carey is a 1986 graduate of Wilson High School, West Lawn,PA. He received his Bachelor of Music Education degree from Susquehanna University in 1990. He has pursued additional studies at Villanova University, through the University of The Arts of Philadelphia, where he studied with Quincy Hilliard, Jerry Nowak, Ed Sueta, and Denis DiBlasio. Mr. Carey has been teaching for 25 years. He has been the band director at Shikellamy High School for eighteen years and the Shikellamy Middle School for 4 years. Prior to his position at Shikellamy, Mr. Carey held the positions of Band Director, Choir Director, Play Director, and Instrumental Music Supervisor at Our Lady of Lourdes Regional High School, Shamokin for seven years. He taught general music, instrumental and vocal classes. 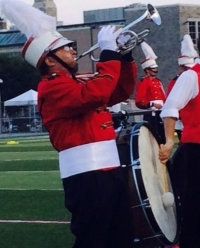 While at Lourdes, Mr. Carey also held the posts of Assistant Marching Band Director at Selinsgrove HS, Marching and Music instructor and Drill designer for Mifflinburg HS, Marching and Music Instructor for Shikellamy High School, Drill Designer for Lewisburg HS and a visual tech for the Reading Buccaneers Drum and Bugle Corps. Mr. Carey is going into his third year as the Brass Caption Head for the Skyliners Drum and Bugle Corps. Educators Association, The International Trumpet Guild, and the American Federation of Musicians.